We spent 30 hours researching and testing over 10 different types of cat doors and found that ease of installation, size, and cost were the most important factors for consumers who were shopping for cat doors. Cat Door – The Original Cathole Interior Pet Door scored high marks in all categories and is our overall top pick. This is the perfect interior cat door that can be used to hide a litter box or just to provide the cat with access to a private place to eat, drink, or rest that is away from the rest of the family. This door features a cool grooming brush that is removable and brushes the dirt, dust, and litter off the cat as he passes through. Finding the right cat door is a serious purchase for cat owners and one that should be made with care and research. The benefits of having an interior cat door are numerous and allow your cat plenty of freedom and privacy. With the right cat door you won’t have to worry about scratches all over your door frame anymore if the cat gets stuck inside a room. With so many different kinds of cat doors on the market it can be really confusing trying to choose the one that will work the best in your home and for your cat. You’ll be choosing from basic models, high-tech gadgets with microchips, and others as well. We have reviewed the three top-rated indoor cat doors below so you can learn about their features, how they are installed, and the benefits that each selection offers. All three of these cat doors provide freedom and privacy for the cats and look great in the door. We have also included a buying guide with information on how to choose the best cat door for your needs, how to determine what your needs are, and what types of indoor cat doors there are. This information will make it a lot easier to sort through all of the available styles so you can make the right decision. The Cathole interior pet door is perfect for using inside your home to block off the litter box or cat food behind closed doors. A feature of this indoor cat door is that it has a removable brush that removes dirt and dust from your cat as he walks through. That is very beneficial for keeping loose litter in the cat box rather than dragging it through the house. This indoor cat door is made of Baltic Birch wood and can be painted to match the trim of your home if you choose. Installation is easy thanks to the included instructions and wood cutting template. 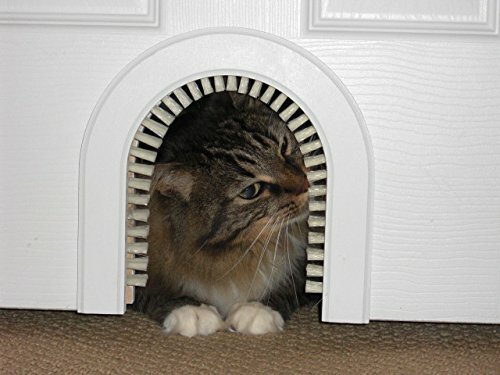 The cat door measures 8 ½” x 8 ½” and is perfect for cats weighing 20 pounds or less. It is the perfect cat door for smaller cats. The Cathole door is just the thing you need to keep the cat litter box out of sight while not blocking it from your cat if they need it. 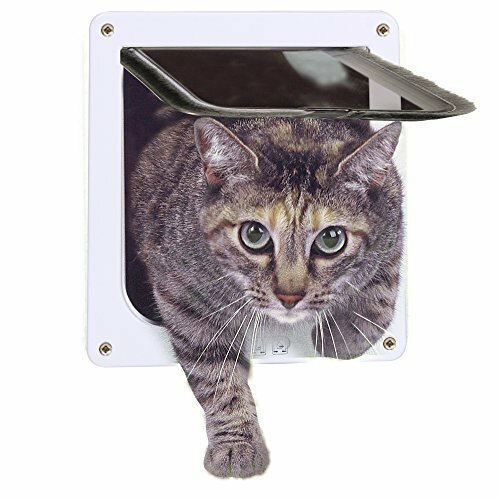 Another great indoor cat door is the Kitty Pass interior cat door. The cute shape of this inside door makes it a favorite with cat lovers. It is a great way to allow you cat to access certain areas that need to be closed off including where you keep the litter pan and prevents your cat from scratching the door frames if it wants to get out of the bedroom after you go to sleep at night. The finish of this interior door is semi-gloss white and it can be painted to match any interior color you choose. The pass-thru is 7 ½” x 6 1’2” tall so it works for most cats but the company recommends that it be used for cats that are less than 20 pounds and smaller in stature. The smooth plastic around the opening won’t snag your cat’s fur and makes going through it stress-free for your cat. Installation is easy and only takes about 25 minutes. There are instructions for installation and a template for cutting the door properly. If you have a cat that likes to come and go when they want, you need to get them a cat door. This convenient cat door is easy to install and comes with all hardware, template, and instructions. This cat door is just the right size for cats weighing less than 15 pounds. The 4-way lock features in only and out only settings depending on what your schedule is and when you want your cat to be able to come and go at will. The clear, unbreakable Lexan used to make this door is weather-resistant and can handle impacts without cracking or breaking. This product comes with a lifetime warranty and offers exceptional customer service that will be happy to help you with whatever you need. This no-frills cat door is easy on the budget as well and allows every cat owner the chance to have a cat door for their cat. The three top-rated cat doors we have reviewed above are all high quality, easy-to-install cat doors that can be install in any interior door. A couple of them can be installed in an exterior door if you prefer. They all offer plenty of features that make them popular with cat owners looking for just the right door for their fur babies. Taking the time to find the right cat door for your needs is a good way to make the whole process simple and easy. Each selection comes with installation instructions and templates that make cutting the door you want to the cat door in super simple and worry-free. Once you are ready to purchase an indoor cat door considering one of the top-rated choices we have listed above is a great place to start. If you do not see the cat door you are looking for we have added 7 additional selections for you to consider. A cat door or cat flap as they are also known is a small area that is fit into an existing wall, window or door that allows cats to pass through easily. The main purpose of a cat door is to offer your cat the freedom to come and go at will. When the doors are placed inside your home they are usually to allow the cat access to a litter pan that is in an out of the way area or two get out of a room when they want without clawing at the doorframe or carpet. Over the years since cat door or flaps were invented there have been significant leaps in technology. Some cat doors are operated by microchip, have locks that allow access only at certain times and offer protection against unwanted intruders. There are many benefits to having an indoor cat door. We’ve listed these benefits below so you can see if this type of cat door is good for your cat and lifestyle. Freedom – cats don’t usually like to be locked up and can make a mess of doorframes, doors, and carpet trying to find a way out. A well-placed indoor cat door allows the cat to come and go as he pleases without having to damage anything in the process. Keeps smelly cat pans out of the way – No one wants to have a cat pan out in the open for guests and visitors to see. Even the most fastidious cat owner can’t completely eliminate the odor a cat pan leaves behind. Having an indoor cat door allows you to put the cat pan out of the way without blocking it from your cat when he or she needs to use it. Allows the cat to get away from children – Placing a cat door in a convenient spot will allow the cat to get away from rambunctious children who won’t leave it alone. The cat can leave the room whenever it feels like it which will reduce the likelihood of a child getting scratched by an irritated cat. Convenience for cat owners – Another benefit to the cat door is the convenience it affords you. If you want to sleep in you won’t have to get up to let the cat out of the room, they can simply leave when they are ready to. Your cat can even go outside if it wants to without disturbing you at all or if it is already outside it can come inside to get away from other animals that may threaten or annoy it. This convenience is also good for people who work a lot. Your cat won’t have to wait for you to get home before it goes outside or comes in it can let itself in or out. Ultimate Safety – Many pet owners that have left their cats outdoors have had their pets suffer injuries from other animals or even predators that may be around. Having a cat door that your cat can use at will means it can get to safety whenever it needs to. An automatic cat door is probably best in this situation since you don’t want other animals following them into your home. This cat door is also great for allowing a cat to escape harm inside the house too as in the case with fire or flooding. Gets rid of boredom – If you cat can roam from room to room at will it is a lot less likely to become bored and in turn get himself into trouble. Boredom can stress out your cat, cause them to gain weight, and in general be unhappy. The freedom they will have with a well-placed indoor cat door will get rid of the frustration they feel from being stuck. Boredom is especially possible for indoor only cats so allowing them to move from room to room freely will make being indoors much better for them. Better health – A cat that has the opportunity to be active is going to be a healthier, happier cat altogether. This is especially true for doors that allow your cat to go outdoors when they want. Getting exercise when they want is always going to make your cat healthier and happier and that is the goal of every cat owner. Fewer accidents – A cat that is not locked in a room or blocked from going outside when it needs to will have a lot less accidents indoors. Every cat owner has experienced their cat scratching the furniture at some time or another when they were home alone with nothing to do. Unwanted behavior usually occurs because of boredom so having the opportunity to take themselves out or move from one room to another freely will benefit them in many ways and reduce the amount of damage and accidents your cat causes. Protect your cat’s food area – Cats are very private when it comes to eating and their sleeping spaces. Having an indoor cat door allows you the option of creating a private space for your cat where his bed, food, and resting spot is kept away from noisy children, dogs, and other bothersome intruders. The cat can escape into their haven through the door but no one else can follow them in. Cat owners always want to do what is best for their cats and that means providing them with the freedom they want to keep them healthy and happy. There are many different styles and types of cat doors on the market. Some are designed for exterior doors, others are both indoor and outdoor cat doors and then there are some that are just for indoor use. Whichever you choose, it is important that you choose the right cat door for your cat and your preferences. Keep in mind that not all cats know how to use cat doors so you will need to introduce it to them and show them it is something great not something to fear. 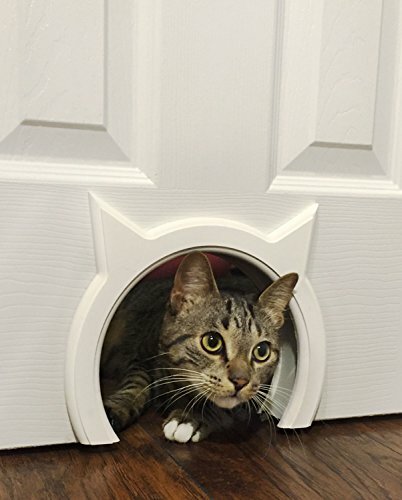 The three top-rated cat doors we have reviewed above are excellent for cats of all sizes and provide the cat owner with a way to offer their cats privacy, freedom, protection, and a happier life free from being locked up. Two of the selections above have openings and no flaps to worry about which is great since many cats don’t like going through a door that they have to push open. Treats are always a great way to teach your cat to use the cat door. Especially if you use their favorite treats. The information that is in this buying guide will help you decide which cat door is the best purchase for you. It has also explained the different benefits that having a cat door provides both the cat and the cat owner. Knowing which cat door to choose and where to put it will make purchasing the right cat door stress free and fun rather than worrisome. All three of the selections we have featured come with instructions so even if you don’t know how to install a cat door at first, you can learn very easily. Your cat will certainly thank you for the freedom, added activity levels, and safety having a cat door provides for him.